In the world of motorsports, Ferodo has achieved many outstanding successes. Through Formula 1, endurance racing, rallying, saloons and other circuits, Ferodo brake products have been the choice of champions, with proven performance and advantage on the track. 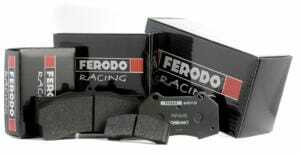 In Australia, Ferodo are a popular option for dual street-track use and for sprint racing. V-Sport stock Ferodo pads to suit a wide range of vehicles in street, track, and rally environments. See the charts below to determine a suitable brake pad material, or scroll down to compare materials by their characteristics and find your pads in the parts finder. DS Performance is a great value option for replacing your OEM brake pads, suitable for daily street and light track use. Intended as a high-performance road/track pad, DS2500 offers powerful and predictable braking at an economical price point. As the benchmark of high-performance brake pads, the Ferodo DS3000R debuted in 1998 and has since contributed to countless podium results in Touring Car & GT championships worldwide. When installed on lighter racing cars, lower brake pressures are required for required deceleration. *Recommended only as a rear pad for Circuit & Rally use. Contact us for more info. Based on a chemical family known as the Siloxanes, Ferodo’s DS1.11 pads are a true ceramic material brake pad. Consistent at even the highest working temperatures, the DS1.11 experiences nil fade and has the longest pad life of the entire Ferodo range. DS UNO pads are proven in GT, Touring, Formula Ford & Rally competition enviroments for their high friction output, consistent modulation and long disc/pad life. Known as the ultimate ‘good feel’ pad, DS UNO performs consistently lap to lap, and throughout the pad’s life.